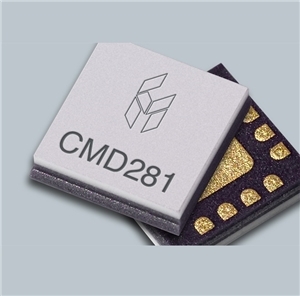 The CMD281C3 is wideband 2-bit digital attenuator that operates from DC to 22 GHz (L, S, C, X, Ku, K Band). Each bit of the attenuator is controlled by a single voltage of either 0 V or -5 V. The attenuator bit values are 2 dB and 4 dB, for a total attenuation of 6 dB with an attenuation accuracy of 0.1 dB step error. It has a low insertion loss of 1.5 dB at 10 GHz and can handle an input power of up to 28 dBm. This wideband GaAs MMIC is available in a 3 x 3 mm ceramic QFN package and is matched to 50 ohms which eliminates the need for RF port matching.